This week in 1968, the Apollo 8 spacecraft became the first crewed mission to orbit the Moon. Astronauts Frank Borman, Bill Anders and Jim Lovell entered lunar orbit on Dec. 24 and held a live broadcast, showing pictures of Earth and the Moon as seen from the spacecraft and reading from the book of Genesis. 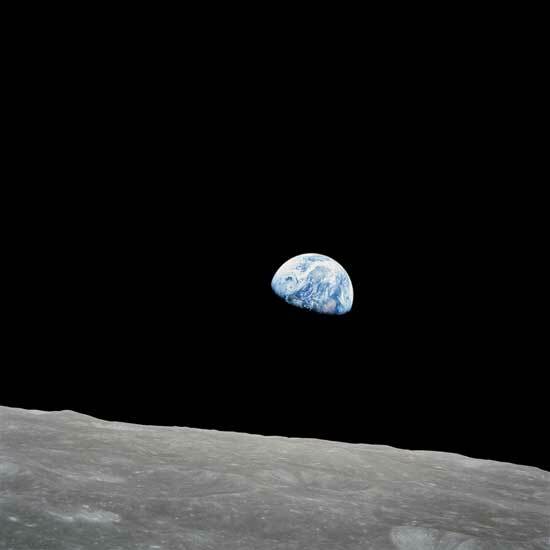 The mission became famous for capturing this iconic “Earthrise” photograph, snapped by Anders as the spacecraft was in the process of rotating. The photo shows Earth rising over the horizon of the Moon and is thought to have sparked the environmental movement. The Apollo 8 mission concluded when the crew splashed down in the Pacific Ocean on Dec. 27. Now through December 2022, NASA will mark the 50th anniversary of the Apollo Program that landed a dozen astronauts on the Moon between July 1969 and December 1972, and the first U.S. crewed mission — Apollo 8 — that circumnavigated the Moon in December 1968. Earthrise and a lot of the Apollo project was imagined by Fritz Lang in the late 1920’s (Crazy I have to put the 19 now that another set of ’20’s are right around the corner.) in “Frau im Mond”.